The Writers and Painters Group "Jung Vilna"
The poet and editor Shmerke Kaczerginski, a Talmud Torah graduate, wrote little but was a chief editor of the group's writings. He was attracted to communism, a leaning that almost led to his arrest by the authorities. Shimshon (Siomka) Kahn, born in the townlet of Troki next to Vilna, grew up next to a gypsy camp and later translated their poetry, as well as poetry in Polish, Belarusian and German. He published poetry, skits and theatre reviews in the Tag newspaper. Vilna had two daily newspapers that were published almost continuously during the period of independent Polish rule. Tag (Day), the Yiddish-speakers’ newspaper, appeared until the Soviet occupation of Vilna during WWII. For reasons of censure, the newspaper often changed its name, but the word Tag always remained. For most of this period, the newspaper’s editor was Zalman Reisin. Bund members and undercover communists worked on the editorial board. Reisin was hostile to Zionism, but supported Territorialism. In the literary weekend supplement, he promoted the city’s writers and poets, and published Polish newspaper reviews and articles about theatre and other local issues. He also published a Zionist daily in Yiddish, Jüdische Zeitung (Jewish Times) to Unsere Freund (Our Friend) to Zeit (Time). Other dailies appeared from time to time, such as the evening commercial paper Avant Courier - which dealt mostly with crime, disturbing family issues, suicides and murders - the government-supporting paper Unsere Stimme, editions of Warsaw papers, and others. Party political, literary and professional journals in both Yiddish and Hebrew were published in Vilna. Most of them lasted less than a year. Many were dedicated to literature and art. Between 1929 and 1930, the Hebrew magazine Galim (Waves) appeared, and included in its content articles from Eretz Israel. The writers' group that concentrated around Galim established the "Hebrew Writers Association." Galim also organized two balls, in which the poet Itzhak Katzenelson participated. After Galim was closed, the Zramim (Currents) magazine appeared, in which the poet Uriel Akavia, the author S. Ben-Zion, the historian Prof. Joseph Klausner, K. Bertini, Yisrael Heilprin and others were contributors. Zramim operated for about nine months, and brought out 18 editions. The Yeshiva (Talmudic college) Council in Vilna, headed by Hayim Ozer Grodzenski, published the weekly Das Wort (The Word), the voice of "Agudath Yisrael," between 1924 and 1938. A number of socialist weeklies were circulated in Vilna, including Baginen (At Dawn), published between 1932 and 1937. The Democratic Party brought out its own magazine, which discussed the territorialist ambitions of the secular Yiddishists. Two Yiddish communist weeklies were closed by the authorities in 1937. In 1932, a trial publication of a weekly brought out every Sabbath was closed due to a protest by the "Guardians of the Sabbath" Society. "The Society of Jewish Writers and Journalists" dealt with the publication of books on culture, literature and history, the commemoration of spiritual leaders and evening discourses on literature, theatre and art. These evenings included a public gathering in honour of writers that visited the city. The society also maintained a loan fund, a fund for the infirm, and a pension fund. The author of its regulations and first chairman was S. Ansky. In 1921, marking the end of the 30-day mourning period since the murder of Yosef Haim Brenner in Jaffa, a memorial evening was held at the people's university founded by "Tarbut." 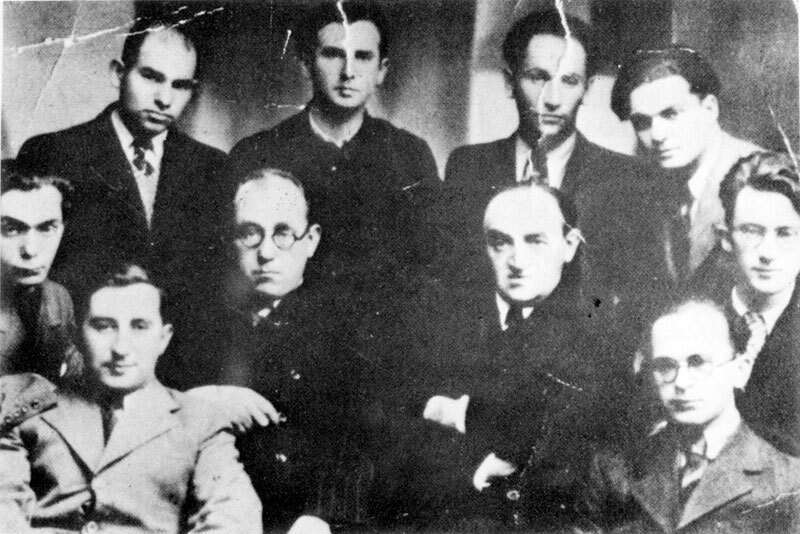 They joined protests over the 1929 riots in Eretz Israel, and in 1937 sent a representative to the World Congress for Yiddish Culture (Yiddisher Kultur Farband - YIKUF) that gathered in Paris. The society declared the struggle against the "Shund" – novels and other publications considered a step down in quality – and published a list of recommended novels and books for reading and purchase. The list was distributed for free, in large numbers. The poet and writer Chaim Grade was born in Vilna. His father was a Hebrew teacher. Grade studied in the Lithuanian yeshivot (Talmudic colleges) in Vilna and its surroundings, including seven years with the “Chazon Ish” (“Avraham of the Play” in Grade’s book Tzemach Atlas). At 22 years old, Grade quit his Torah studies and began to attain a general education and to write Yiddish poetry. Grade’s works induced an immediate interest in Vilna. He joined a group of other writers in the city, and was one of the leaders of Jung Vilna. During WWII, Grade was a refugee in Russia. At the war’s end, he emigrated to the US where he continued to create poetry and began to write prose. His works dealt with Polish Jewry in general and that of Vilna in particular. His books commemorated the destroyed Jewish world, and he dealt largely with the tension between the secular and religious communities in Vilna, as well as with the mental and spiritual angst of the Jews that stood at the edge of Enlightenment, but still felt a connection to their traditional world. One of his anthologies was dedicated to his wife, who perished during the Holocaust, and another was written about the refugee life that he experienced in the USSR. Grade’s wish was not only to create works of literature, but also to document ethnographically the Judaism that had been lost. The US Academy for Jewish Sciences presented Grade with a medal of honour, and ensured that his works were held in the highest historical regard as an exalted tombstone to an extinct world.